On his tour as the winner of the Mu Phi Epsilon Foundation Performance Award clarinetist Katsuya Yuasa stopped by our local university for a recital, along with his accompanist Sakurako Kanemitsu. He is both a skilled and an entertaining musician. I was most interested in the chosen repertoire which went back only as far as 1899. Solo de Concours (1899) by Andre Messager is a post romantic piece whose life began as an academic exam requested by Gabriel Fauré. I like for the romantic style to at least make a showing, and this was excellent. Flute Sonata, Op. 94 (1943), 1. 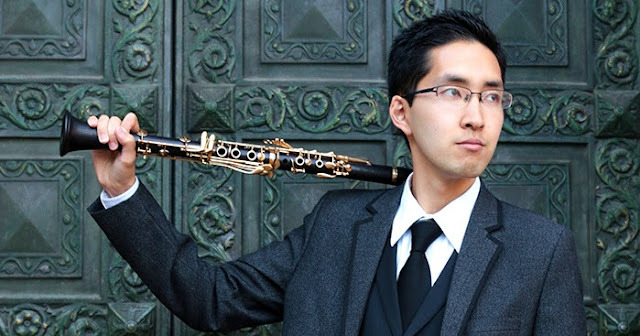 Moderato, by Sergey Prokofiev is more modern, and was arranged for clarinet by Kent Kennan. Prokofiev is supposed to have composed this in his free time. Premiere Rhapsodie (1909/10) by Claude Debussy strangely also requested by Fauré. I admired his technique here but always feel that Debussy requires something more. Pocket Size Sonata (1957) in three short movements by Alec Templeton adds jazz to our clarinetist's broad range of styles. He's very musical. Fuer Arvo (2018) by Ryan Suleiman was presented as a world premier. The composer was present. And yes, the Arvo is Arvo Pärt. It is a response to one of the older composer's compositions. I have taken the liberty of redating this piece from 2017, since music is normally dated on the date of the world premier performance. This was minimalist like Pärt. Fantasie for Solo Clarinet (1993) by Jorg Widmann was for the clarinet alone. This piece is for fun, to show off all the many things you can do with a clarinet, including slurs that I may only have heard in Rhapsody in Blue. He has this stuff all down. Time Pieces, Op. 43 (1983) in four movements by Robert Muczynski finished the recital. I found that our performer's enthusiasm for performing along with his skill made this a very pleasing recital. Good luck in the future.